MoHow Posted by Joel Simms I’ll be 67 next month and I have maintained my weight at around 180 pounds for 50 years. I am six feet tall and weighed 179 lbs in 1964. I weigh 182 lbs today. If you have had challenges with your weight this post may interest you..
1. Calories in, calories out. It’s really quite simple when you get down to it. If you consume more calories than you burn, you will gain weight. So what I do is adjust the amount of food I eat each day, and every couple of days, dependent upon my activity level. More physical activity, eat more. More sedentary, eat less. Overeat, exercise more. 2. Know your reasons to be fit. I have two grandchildren, a boy,, Zale, born 2 weeks ago, and a granddaughter, Lilly, who will be 7 in June. I want to be able to play ball with Zale when he is a teenager, and I want to be able to dance the jitter bug at Lilly’s wedding. When I get tempted to eat excessively or eat junk food, I ask myself whether I want the food or want to be with my grandchildren in the future. When you have powerful reasons like this, and remember that you can make good choices, it’s easier to be strong when you’d otherwise give in. 3. Begin with small steps. If you are overweight, you don’t have to totally change your diet overnight. I highly recommend changing it one step at a time. Here’s what I do…I drink water instead of soft drinks and eat fruit instead of candy or chips. Then add other changes after a week or two, and so on until you’re eating much healthier a few months later. This step by step process makes it much easier to stick with a healthy diet. 4. Eat foods you love. I love great breakfasts and salads; each one of us has our own preferences. Don’t eat foods just because they’re good for you, eat them because they’re healthy and you love them. 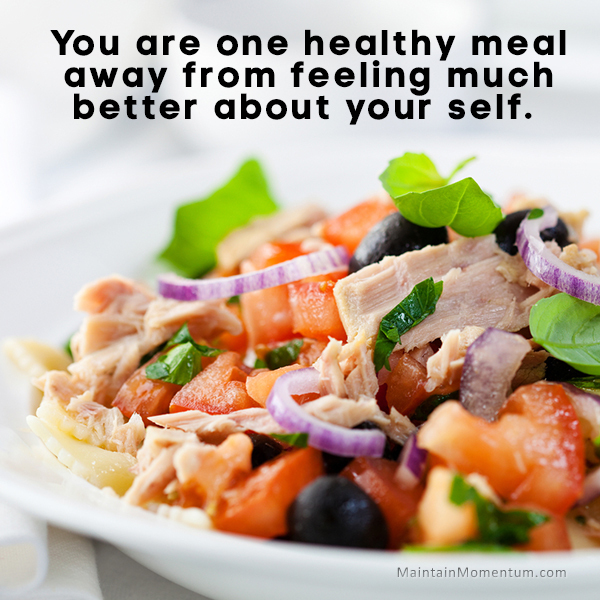 For me, that means eating berries, nuts, seeds, yogurt and granola for breakfast and salads with chicken, tofu and great vegetables for other meals. For you it might be oatmeal, fish, lean beef, cheese, and other fruits and vegetables. Find the foods you love that are healthy, and you’ll stick with the diet much longer. 5. Take it with you. Always bring healthy food with you, wherever you go. Sometimes this just means packing snacks if you’re going on a few errands (I like almonds and fruit), other times you might want to pack more substantial meals. Bringing your lunch to work is a great idea, along with snacks to keep you satisfied all day. 6. Eat before you go. If you’re going out to a restaurant or party, eat a small healthy snack first. That way you won’t be starving and won’t need to eat a huge amount of unhealthy food. You can get by on a salad or some fish and steamed veggies or an appetizer or something like that, and still enjoy the company of your friends and loved ones. You’ll save money and calories! 7. Choose healthy food when you eat out. If you go to a restaurant or party, look for the healthy choices. I love a good salad bar, but you could also choose a lean cut of meat, grilled not fried, with steamed veggies, or some black bean or lentil soup, or something like that. 8. Indulge in small bites. I don’t believe in never allowing myself to eat treats such as chocolate cake. But the key is to eat healthy most of the time, and when you do indulge in a treat, do it in small amounts. A single slice of cake or scoop of ice cream, for example, won’t kill your diet. However, eating a second, or third, slice of cheesecake… that’s a no no. 9. Empty your home of unhealthy snacks and foods. If you have junk food in your home, you’re more likely to give in at some point and eat it. But if you clear your home of these foods, you won’t have that temptation. Clear your refrigerator and pantry of candy, baked sweets, fried foods, foods made with refined flour, fatty and greasy things like chips and fries, and so on. 10. Don’t overfill yourself. Make this your number one rule. Even if you break down and eat some fatty, fried food at a restaurant or party, only eat a bit. This way you can eat the unhealthy stuff and still limit the damage. 11. Don’t starve yourself. You only want to cut a moderate amount of calories from your diet. Because if you starve yourself, you’ll lose muscle, get unhealthy and end up falling off the diet eventually. 12. And finally, if you overeat, burn it off. On occasion you may break the healthy eating rules. That’s OK. Don’t beat yourself up about it, just get back on track. Burn off the calories by running, walking briskly, playing sports, whatever it takes. Then continue your healthy eating. Do you have other strategies for sticking with a healthy diet that work for you? If you do, please share them in the comments! This post provides you with fundamental information. If you want further help and coaching contact me at: joelsimms@maintainmomentum.com. If you found this post useful consider subscribing to this blog, and if you want more help and support, including the MOmentum Mind positive self-talk training course, and a wide range of specific motivational tools, resources, and a morning boost in the form of my morning email AmMo to help you get going every day, consider joining www.maintainmomentum.com.